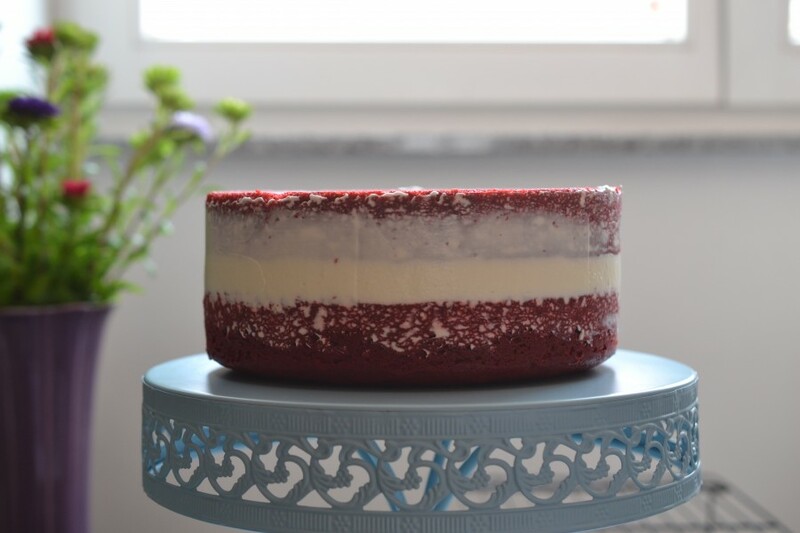 Can there be a more dramatic cake than a classic Red Velvet?! Seriously, this cake has a history, a social media presence, and throws all kinda shade on her double-layer cousins. Thing is… it’s all truth! Most American cooking and baking experts agree this cake first appeared during the Great Depression. While it was served at the Waldorf Astoria in New York City, it’s considered a staple in the Southern culinary arsenal. 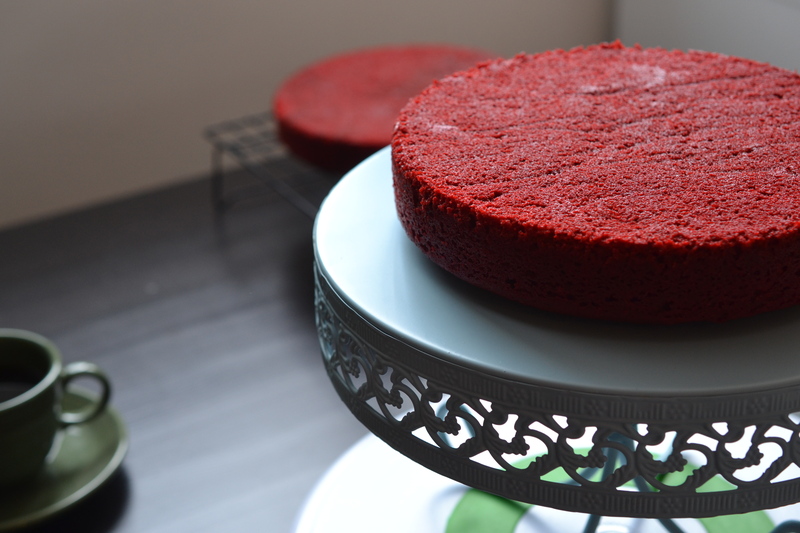 I converted to the truth of Red Velvet cake when my mother-in-law served me my very first slice… we were visiting her in Alabama. The moment is frozen in time; I remember it like it was yesterday. 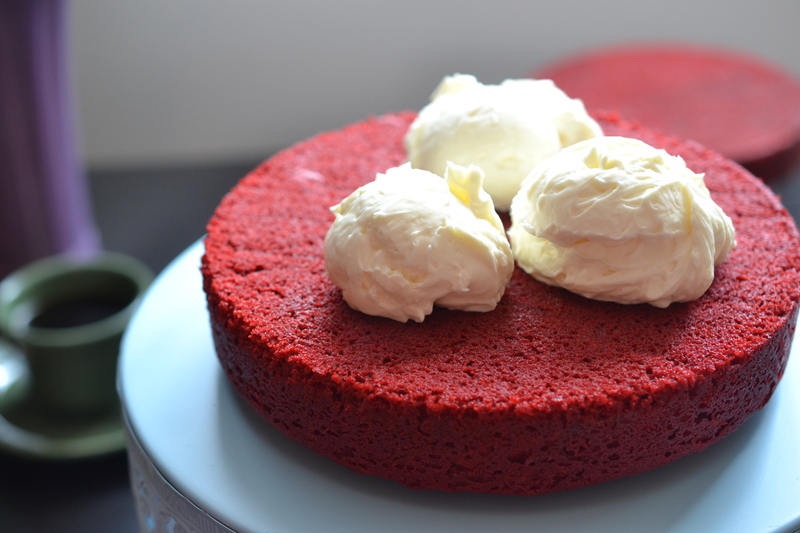 The power of Red Velvet. 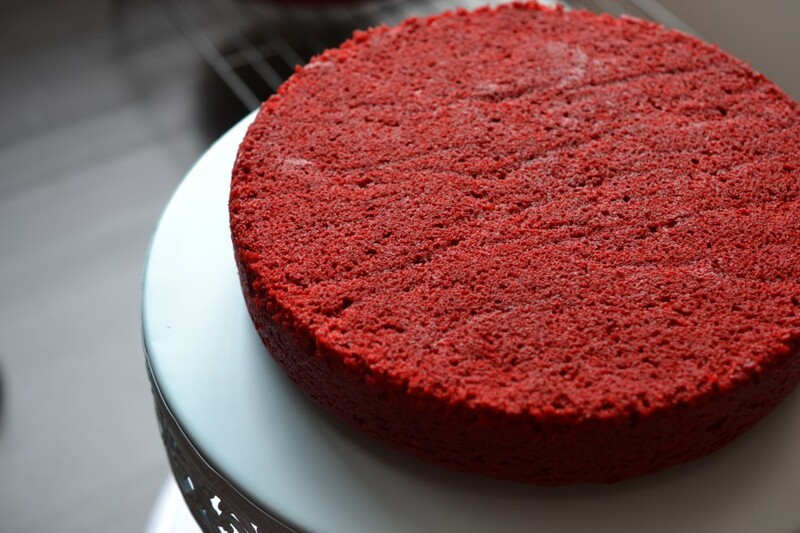 I’ve continued to work my Red Velvet Layer Cake recipe.. and it’s at the point of consistent results with delicious flavor. 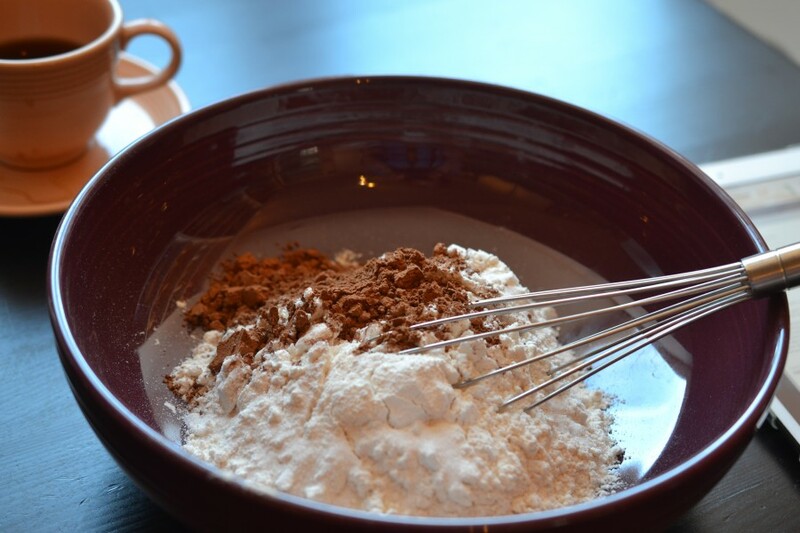 With so many variables attributing to the success, get to know your ingredients and fiddle with the recipe to your own liking. Those tops look so lovely. 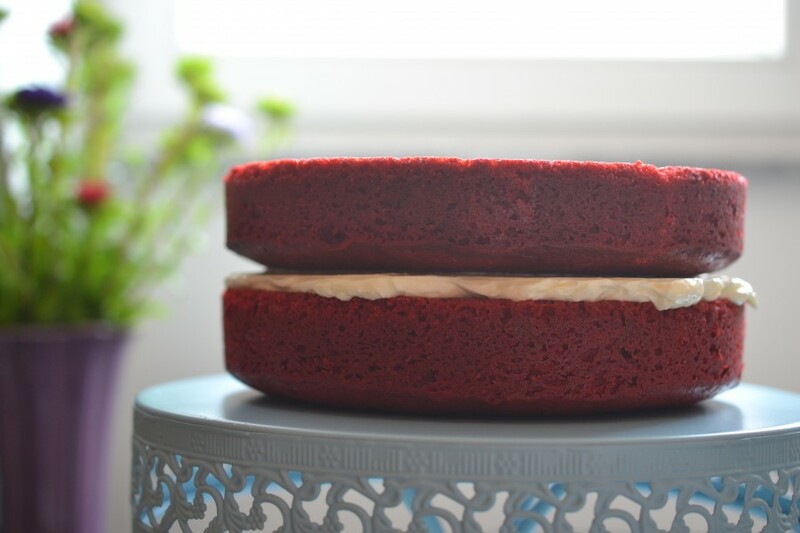 Please take the time to line the bottom of your cake rounds parchment paper. 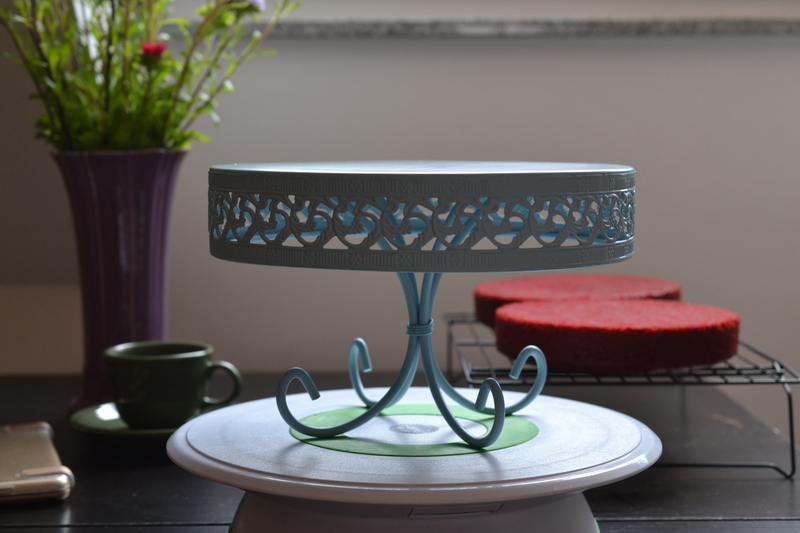 A dramatic cake deserves an equally dramatic cake stand. 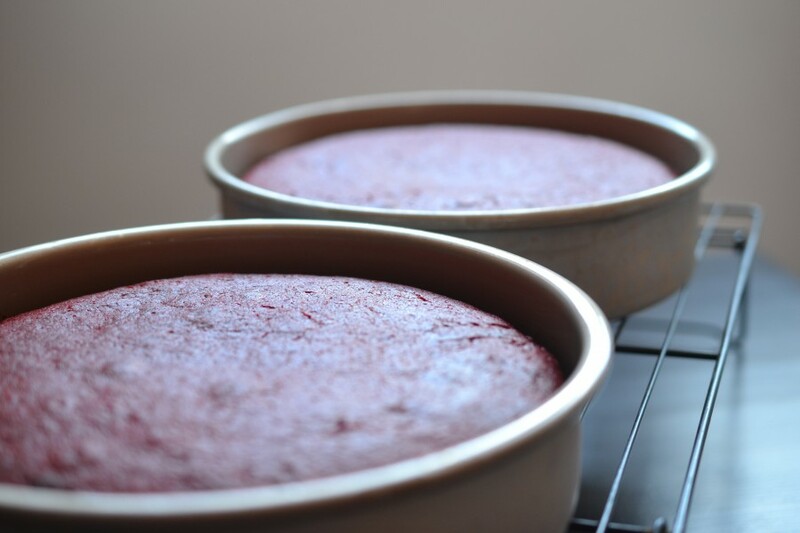 The rounds were in the cake fridge for a few hours before filling and frosting. I had errands to run and it was important to make sure the cake was cooled – in order to reduce crumbs doing crumbly things. Cream Cheese Frosting is still my favorite. 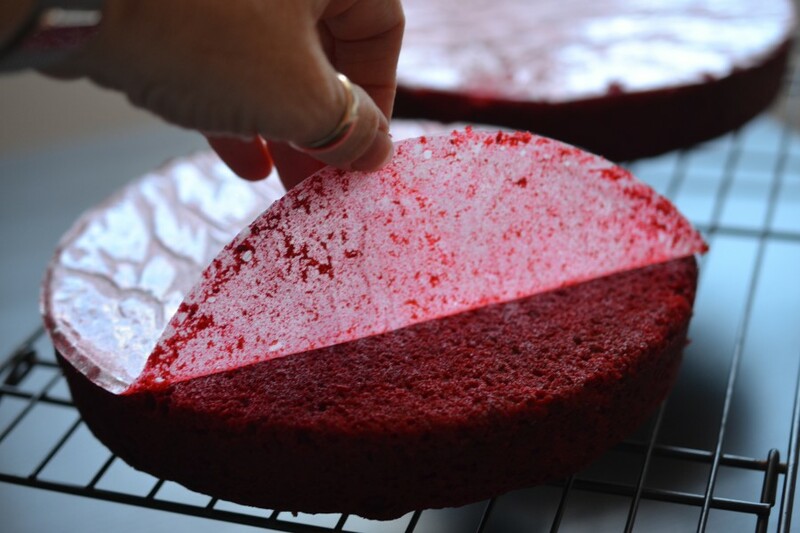 With only two layers, it’s not nearly as important to measure the filling. Maybe that happened from habit. 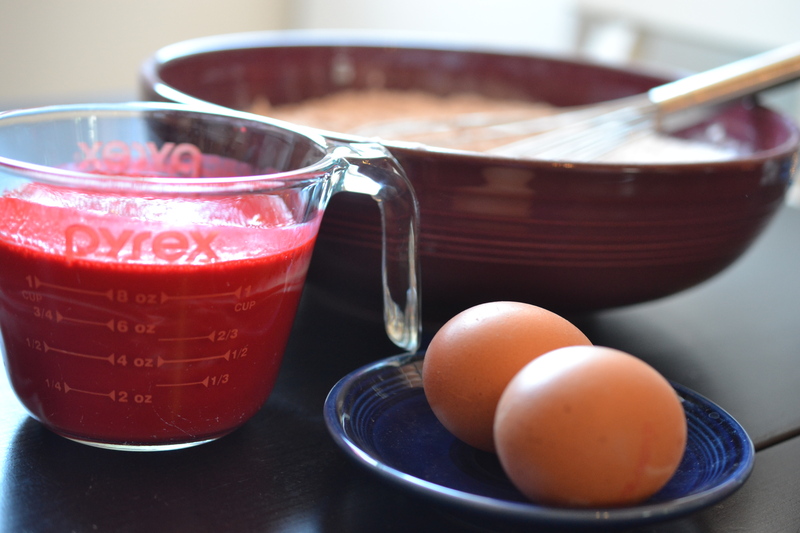 Even layers are the direct result of weighing the prepared pans empty and then weighing them with equal portions of cake batter (taking into account any weight difference). Once filled, this cake is perfectly presentable. 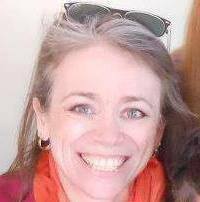 Taking a look at how the layers are stacked – it was my design choice to have a flat top surface instead of domed. 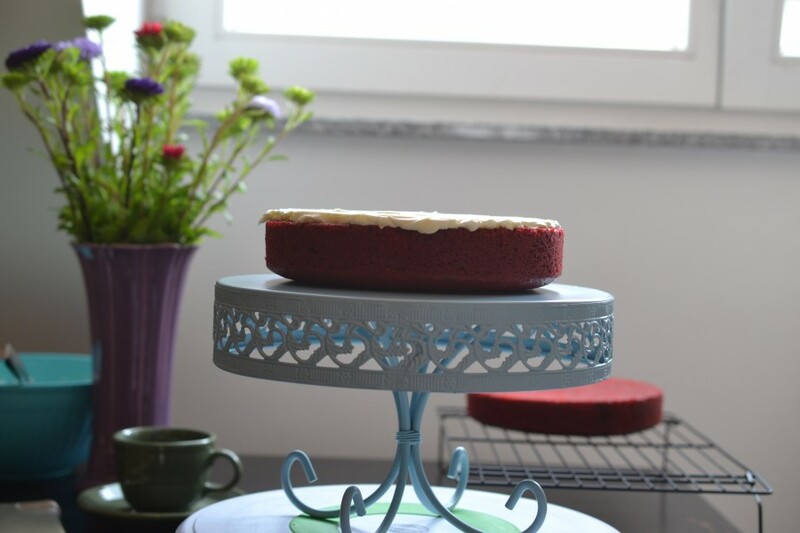 When you’re preparing your own cake – the decision is up to you (and there isn’t a wrong choice!). 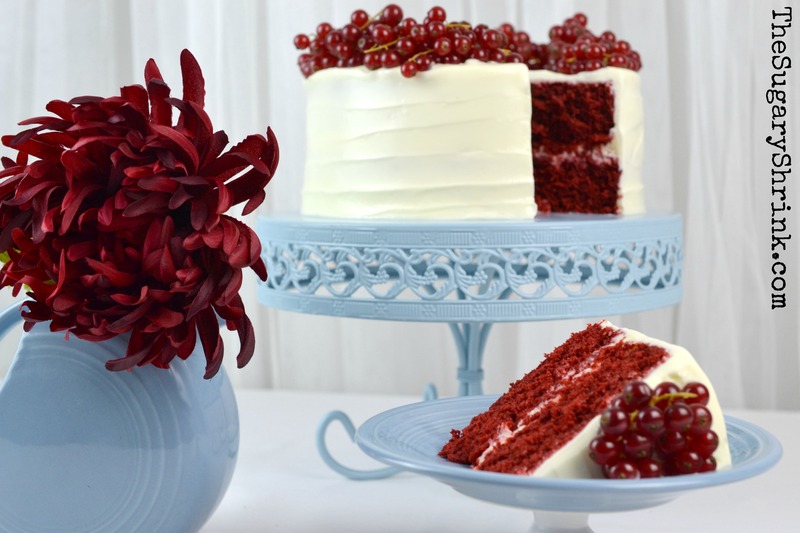 I wanted to continue highlighting the beautiful color of the cake by adding a crown of fresh red currants. It’s an ideal visual complement and brings a bit of tart to the sweet of the cake. Isn’t it just fun to look at, too? 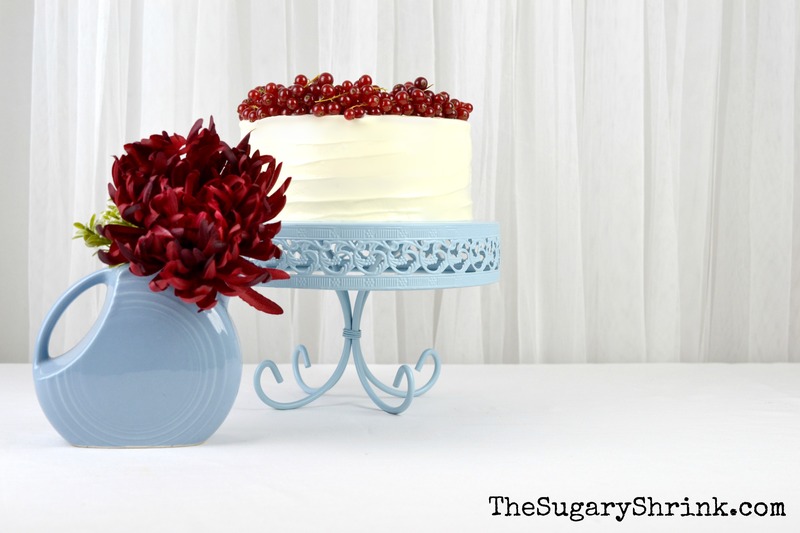 My Homer Laughlin Fiesta Dinnerware in Periwinkle couldn’t be more perfect match with this cake stand. I’m grateful for my life partner husband; he’s a Renaissance Man from the South. I’m grateful for our people and the people they bring. None of my life is possible without sobriety. Next story Pineapple Upside Down Cake – On The Go!